As much serving tray as it is cutting board, this 19 1/2" by 13 1/2" solid hardwood cutting board is perfect for carving roasts or poultry either on the kitchen counter or at the dining room table. Rubber feet keep the Mundial large cutting board in place while you work, as well as lifting the board off the countertop and away from damaging liquids. Wet surfaces can cause wooden cutting blocks and boards to swell, warp, or crack. If you leave the Mundial board on the counter for a few hours while you serve dinner and relax, it won't be left sitting in the damp. The cutting surface has a deep routed groove designed to catch drippings from cooked meat, but the routed handle area seems to me to be a pointless addition to an otherwise sensible board. With a thickness of 1 1/4" this board is heavy enough for chopping work and the extra size leaves plenty of working surface, but a plain reversible cutting board might be more practical for everyday chores. The Mundial will be a little more difficult to clean, and some of the features make better sense as serving ware than as butcher block. Regular oiling of the board is important if you want it to last and remain in good condition. 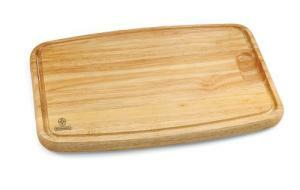 Wooden boards are not dishwasher proof and should always be cleaned by hand. Mundial cutlery is just as good as this cutting board, if not better. Here's a 3-piece starter set to whet your appetite.